Brooklyn Beta is a small, friendly web conference aimed at the “work hard and be nice to people” crowd. Once a year, we welcome some of the friendliest web designers, developers, and entrepreneurs to Brooklyn, and we invite speakers to highlight meaningful problems that need our help. Our goal is to inspire you to make something you love, so we get all the people who can turn an idea into reality in one place and try our best to make it happen. Brooklyn Beta 2012 takes place at the Invisible Dog on October 10th, 11th, and 12th. Mark your calendar. Sign up for our mailing list to stay up to date with the latest news. Please note that this year’s conference is sold out. If you missed tickets, check out Beyond Beta. The best conference I’ve ever been to! This is my kind of conference. I loved it. Never have I attended an event with as much heart, talent, and awesomeness. The best conference you could ever attend. Amazing. Wonderful. Energetic. Inspiring. Full of love. The best conference I’ve ever been to. 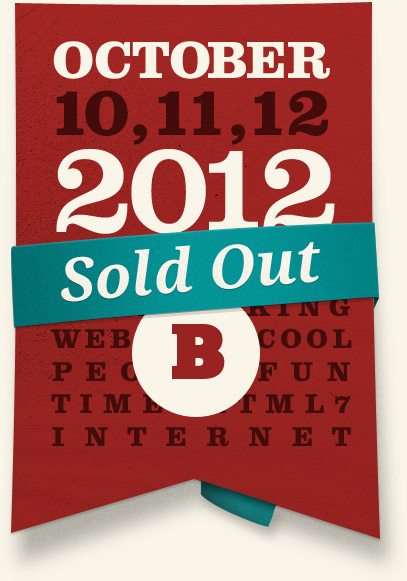 It’s unbelievable how beyond magical Brooklyn Beta and all its attendees are. The best conference I’ve ever attended! I really hated leaving the crowd tonight. The first web conference where a speaker moved me to tears. Brooklyn Beta was the most important conference I’ve been to. By far the best conference I’ve been to. Brooklyn Beta has technically come to an end, but the impact is just beginning. © Brooklyn Beta 2013. All rights reserved.